The 1978 incarnation of Superman brought back a superhero from simpler times. What works so well about the movie is that it plays the story absolutely straight, without guile or a wink at the audience. Superman is the kind of guy who calls women “miss.” He rescues kittens from trees and foils Lex Luthor’s evil plan to cut California loose from North America. Superman faithfully tells the story of the birth of the hero from Krypton to Smallville to Metropolis. It spends so much time on his back story, that it’s a good hour into the movie before he finally gets to make his appearance in cape and tights. But it’s a satisfying payoff when the moment finally comes and the movie continues to deliver fun and action. 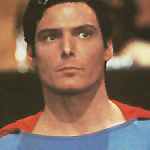 The late Christopher Reeve was a great Superman, and not just because of good looks and his 6’4” muscular frame. He was also able to transform from superhero to a bumbling and awkward Clark Kent. And no, it wasn’t just the glasses. No one could miss the irony that Reeve, who had done some of his own stunts in the movie, became a quadraplegic after a fall from a horse in 1995. To many, his continued public appearances and aggressive advocacy of medical research for people with spinal cord injuries, made him a true hero.